A series of recent articles not included in the book. Follow up to my May 11th dream. Is “The day of the Lord” the Rapture? Why I see a 7 year period called the Great Tribulation. What could trigger the beginning of the Great tribulation? The danger in teaching a post-Trib or last trumpet rapture. What I am going to share in this study will not be received by most, but I believe God&CloseCurlyQuote;s remnant &NewLine;will hear God&CloseCurlyQuote;s voice in this important study. This study is not a “Thus Saith the Lord&CloseCurlyDoubleQuote; message, &NewLine;but be sure of this, it does contain important “Thus Saith the Lord&CloseCurlyDoubleQuote; components. I believe we are in the same place in history as America was on the eve of the attack on Pearl Harbor. The days before that infamous time in our history, intelligence officers working for our military were frantically working to break the code of messages that contained evil plans that were soon to be unleashed on America. On the eve of Pearl Harbor on December 6th 1941 the code was broken. The intelligence people knew they had to get a warning out but time was against them. The warning did not arrive in time. The failure to get this warning to the right people on time was caused by a failure to recognize the importance of this warning. Click here to continue reading. I had a dream on May 11th 2013; this dream has caused me much concern, my wanting to know if this is a revelation from God. God has called me into the prophetic and as a watchman on the wall. I have seen God confirming his call on my life with many signs and wonders. God called me to write a book on His soon return, but I have witnessed an incredible lack of interest in Christ’s coming. Many pastors will no longer preach on this subject. I labored several days over whether I should send this message to my Facebook friends and the contacts from the sale of my book. I have decided that God has not given me light to hide it under a bushel. Some of my friends will pass this off lightly, some will defriend me. I am willing to accept any criticism from man, in my efforts to be obedient to God. Below I will explain and share this dream. It is now Tuesday evening May 14th. On Saturday, May 11th I woke up from just having a dream that was not like my normal dreams, I could remember every detail and conversation concerning this dream. In this dream, I was with people I knew from the Northwest Seattle area. It was about an earthquake that was about to hit the Northwest. It had not yet happened, but we were discussing it as if it had already happened. In the dream we knew this quake was of the same magnitude as the earthquake that hit Alaska in 1964 which is said to have been a magnitude 9.2. Like I said, we were discussing it as if it had happened but it had not yet happened. It was like I was warning the people I knew, but they would not take it seriously. However, they seemed to know it was going to happen. I feel it will happen soon, because in the dream we were talking as if we knew it were about to happen. I am also praying that if it has to happen that it will happen on a weekend when office buildings are not occupied. I prayed for three days that God would let me know if this dream was really going to happen, I even asked if God would give this dream to me a second time, but this did not happen. This morning as I was praying, I continued to ask for God to confirm if this dream were from him. I then went to my office to read my Bible. As I was reading my Bible, I just happened to be reading from the book of Psalms and this verse jumped out at me. Psalms 18:6-7"In my distress I called to the Lord: I cried to my God for help. From his temple he heard my voice; my cry came before him, into his ears. The earth trembled and quaked, and the foundations of the mountains shook; they trembled because he was angry." It has dawned on me that this dream has a very interesting parallel to Christ’s return. My Christian friends and the church in general know that Jesus is coming soon; they talk about His coming as if it was coming very soon, but they are not taking it seriously. They are not preparing for this event. The week following my dream I made the decision to send this message down to my Facebook friends. Many of my friends sent me positive comments, and one of my friends sent me a link to a prophecy given by Pastor Jonathan Hanson. On December 1995, Rev. Jonathan Hanson gave a prophecy regarding many predictions of what would happen to America in the coming years. Most have come to pass with great accuracy. (Goggle, “Jonathan Hanson Prophecies” and check it out.) One item that is yet to happen was a predicted powerful Northwest earthquake. The detail of this earthquake leaves no doubt that this event has not been fulfilled to date. Rev Hanson prophesied that Mt. Rainier would erupt, and the earthquake happening with this event would collapse the 520 floating bridge that crosses Lake Washington. When Rev. Jonathan Hanson was interviewed by Sid Roth on “Its Supernatural” Rev. Hanson said that following the Northwest earthquake, both the stock market would collapse and civil unrest would follow. Now, I realize that many would say that to link a prophecy that goes back many years to my dream is a real stretch. I would also agree if it was not for what happened the following day. For those of you who have visited my website, www.tribulationtruth.com . If you have read some of the testimonies, you may have read the testimony about a Pastor, Joseph Essilfie, from Atlanta Georgia, who shared his dream with me last August. In his dream, God was showing him the same window of the Lord’s return as my book. Then three days after his dream while praying for answers, He asked the Lord, “What am I do with this dream?” The Lord told him to turn on the TV to the Trinity Broadcasting Network. The minute he found this channel, Paul Crouch was introducing my book with the title showing Pastor Joseph the theme of his dream was in the title of my book. A few Days ago, Pastor Joseph called to tell me that God has been sharing things with him that are really troubling. He went on to tell me that the Lord told him that it is the time of the “Distress of Nations”. Then the Lord told him that in the next few weeks there would be a rumbling of a volcano in the Northwest. This rumbling would be followed by a major eruption of a volcano, along with a major earthquake in the Northwest. What you have to realize is that Pastor Joseph did not know about my dream, I had to jump in and tell him what the Lord had shown me in a dream. What the Lord shared with Pastor Joseph was another confirmation for my dream and confirming to the both of us that things are about to happen. I really don’t know the timing of my dream, and Pastor Joseph does not know how long from the rumbling of the first volcano to the full blown eruption and the earthquake of the second volcano. All I know is, in my dream it seemed like this event was to happen soon. I believe God wants to get the attention of the church. I believe that too many Christians are not living like a bride that is waiting with great anticipation for the groom to show up to take us to the marriage and to our new home that has been prepared for us. I pray we will wake up soon so that God does not have to shake us to hard to get our attention. The Bible says Jesus is coming for a pure bride without spot or wrinkle! When I heard Hal Lindsey try to explain away 2Thess. 2:1-3, saying that the Day of the Lord is not the Rapture, but a 1,000 year period starting with the Great Tribulation, I knew I had to challenge this thinking. If you read 2Thess.2:1-3, it says the Christians in the church were concerned that the Day of the Lord had already occurred. How can this mean1,000 years: they were concerned they had missed the rapture, a one day event, not fearing they had missed a 1,000 year event. This verse also says that the gathering or rapture cannot happen until a falling way occurs and the antichrist is revealed. This compels the pre-Trib teachers to disarm this verse. Read 1Thess.5:1-2: “Now brothers, about times and dates we do not need to write to you, for you know that the Day of the Lord will come like a thief in the night.” This is not talking about a 1,000 year period; (How can 1,000 years sneak up on you?) This is talking about the Rapture with the wrath of God to follow. I have discovered in my study that the Day of the Lord is actually the Rapture followed by the wrath of God. Read Joel 2:31: “The Sun will be turned to darkness and the moon to blood before the coming of the great and dreadful day of the Lord.” Notice that this verse goes along with the opening of the 6th seal where the sun goes dark. Also notice it is described as the great and dreadful day of the Lord. It is great day because the rapture is about to take place and it is a dreadful day for the wrath of God is about to be poured out. Rev.8:1 is the opening of the seventh seal and when it is opened there is silence in heaven for 30 minutes. “When he opened the seventh the seal, there was silence in heaven for half an hour.” I believe this silence will start the moment the saints are led to the throne of God by Jesus who just met us in the clouds. When we arrive at the throne we will be in such awe to be in the presence of Almighty God that we will be speechless. All the angels and heavenly beings will also be speechless as they witness the unfolding of God’s redemption. This silence will go on until our heavenly father breaks the silence and welcomes the bride of his son to our new heavenly home. If you read further in Rev.8:2 it says “And I saw the seven angels who stand before God and to them were given the seven trumpets” These trumpets are the seven trumpets of God’s wrath. When you read Joel 2:31 you will see what I mean. It is a great day for the saints who are raptured and it is a dreadful day for the unrepentant that are left behind to face the wrath of God. Some are trying to say that the seven trumpets is not the wrath of God. I believe the rapture happens after the sixth seal when the sun goes dark and the moon does not give off its light. If you read further down in chapter six, you will see it is talking about the wrath of God that is about to be released. Rev.6:16, 17 “They called to the mountains and the rocks, “Fall on us and hide us from the face of him who sits on the throne and from the wrath of the Lamb! For the great day of their wrath has come, and who can stand?” Notice this is the wrath of the one who sits on the throne and the wrath of the Lamb. Almighty God sits on the throne, and there is no mistaking that this is the wrath of God that is about to take place after the sixth seal. I have been challenged on this point a few times. I have been told that a 7 year Great Tribulation is not scriptural. They tell me it is only 3.5 years. I am going to share my reasoning for seeing a 7 year Great Tribulation. First, we all accept that Daniel saw a period of history called “Daniel’s 70 weeks”. It is also accepted that historically 69 weeks of years has been fulfilled. This leaves one week of years left and this one week of years is a period of 7 years. In Daniel 12:1 it says: “There will be a time of distress such as has not happened since the beginning of nations until then.” I contend that this period of distress is the 7 year Great Tribulation. When this time of distress starts, it is my belief that this is the start of the Great Tribulation. Now read on in this same verse: “But at this time your people – everyone whose name is found written in the book—will be delivered. Multitudes who sleep in the dust of the earth will awake: some to everlasting life.” What the second portion of this verse is saying is that during this time of great distress, God’s people will be delivered. This is the rapture. The next question is “Can it be established when this deliverance or rapture will take place?” In Daniel 12:6 the question is asked: “How long will it be before these astonishing things are fulfilled?” What are the astonishing things being referred to? If you look back, you see this would be the period of great distress and the deliverance of the saints; the rapture. If you look at Daniel 12:7 you will see the answer: “and I heard him swear by him who lives forever, saying, It will be for time, times and half a time. When the power of the holy people has been finally broken, all these things will be completed.” This is describing a 3.5 year period of time. If you read Rev. 13:5,7 you will see this same 3.5 year period of War on the Saints and the saints being defeated. Rev.13:5,7: “The beast was given a mouth to utter proud words and blasphemies and to exercise his authority for forty-two months. He was given power to make war against the saints and to conquer them. And he was given authority over every tribe, people, language and nation.” (Many teachers on the end times have misinterpreted these verses to say the antichrist will only rule for 3.5 years. This is wrong; this reference concerns the war on the saints) Go back to Daniel 7:21,22 to read about this same battle (the War on the Saints). This verse says that it lasted until “the Ancient of Days pronounced judgment in favor of the saints and then goes on to say that the saints possessed the kingdom. The kingdom is in heaven and if we are to possess it, we will have to arrive there, and the method of our arrival will be the rapture. Again in Daniel 7:25 it says that this time of War on the Saints will last for 3.5 years. I believe I have fully established the first 3.5 years of the Great Tribulation will lead up to the deliverance of the saints at the rapture. When you study scripture you see that the antichrist establishes a 7 year peace with the Jews and it is broken in the middle which supports a 7 year period that is broken into two 3.5 year periods. I see the first 3.5 years as the wrath of the antichrist period and the second 3.5 years as the wrath of God period. 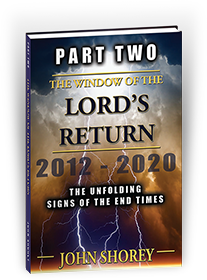 In the Daniel study in chapter 10 of my book, “The Window of the Lord’s Return”, you will see that God shares how long it will be from the time that the antichrist breaks his peace with the nation of Israel until the end of the Great Tribulation. The answer to this question establishes that the second period of time is also 3.5 years. To make an issue of whether the Great Tribulation is seven years or 3.5 years is really majoring on a minor issue in my opinion. In my last printing, I shared a story I was told by a pastor friend. In this story it was related to me that in Africa a tribe that had two churches was taught two versions regarding the last days. One was taught that they would be taken to heaven before hard times and the other church was taught that they would go through hard times and some may even die before the Lord returns. They were told that God’s grace would abound and they would be able to handle what ever happened. When a group of rebels came through their village killing many, the group that was taught they would be gone before hard times was devastated. Many from this church lost their faith. The other church grew stronger in their faith. I have since been able to check out the source of this story and I learned it had been changed in the telling. What I learned was this story did not take place in Africa, but it was in Europe just before the Second World War. The Christian church in Europe was strong at this time. During the time leading up to World War II the European church was taught that the Lord was coming soon and they would see the rapture of the church before Great Tribulation. Many believed that Hitler was the antichrist. When the war and great persecution came and no way of escape arrived, millions of Jews and Christians were killed. The church had false expectations of the coming rapture and when it didn’t happen in the manner they believe it would, it devastated the church. The sad truth is the church in Europe never fully recovered from this error in teaching. It saddens me to see that Satan is about to use the same game plan on the church in America, when the coming economic collapse occurs and a one world government is formed. The church in America will be seeing great tribulation before the Great Tribulation even starts and I believe this will lead to the great falling way that Paul spoke about that would happen before the gathering unto Him as written in 2Thess 2:1-3. I believe 2Peter shows that the church will be surprised to find that the rapture does not come as soon as we expect. 2Peter 3:3-4a: “First of all, you must understand that in the last days scoffers will come, scoffing and following their own evil desires. They will say, “Where is this coming he promised?” It is easier to face times of trouble if you know it is coming and you know that God will give you the grace to be able to handle whatever comes our way. Remember eleven of the twelve disciples were martyred for their faith but they stayed true to the end. Let me close with this reminder: I in no way believe that God’s elect will be on the earth during the outpouring of God’s wrath. The first half of the 7 year tribulation period will be the wrath of the antichrist or as it is referred to in the Bible as the War on the Saints. These verses (Daniel 7: 25 and 7:21-22, Rev. 13: 5-7) , show 3.5 years of Great Tribulation for the saints and then God’s deliverance: the Rapture. I show in Chapter 10 of my book, “The Window of the Lord’s Return” that a global economic collapse will probably be the event that will cause the nations of the world to give up their independence and join a one world government. The trigger event that sets the global economic collapse in motion could come in many different forms. It could be a natural disaster of the greatest magnitude. Imagine an earthquake hitting the west coast equal to what hit Japan in 2011; it could bankrupt several states and cause a panic on Wall Street that could drag our whole country down. When America was hit by terrorists on 9/11, it was a time when our economy was strong and we recovered; if we were to get hit today with another 9/11 event or larger, I don’t believe with the condition of our economy today that we would recover. If a smaller country in Europe has an economic collapse, this event could trigger panic that could take down all of Europe and ripple to America. One possible trigger event that came to me recently, is the effect of a national or regional electrical grid collapse. We just experienced an electrical power outage that took out the power to several towns in the area I live in Arizona. It only lasted a few hours, but it happened during critical hours of the day. I was going to the grocery store and it was closed. I was allowed in for other business purposes and I noticed that everyone was scrambling to protect the produce and everything in the coolers. Realize if this outage would have lasted for 24 hours, most of the fresh produce, meats and all the frozen foods would have been ruined. I was also on my way to the bank and it was closed. I needed to go to the Post Office and it was closed. If a large region of the United States was to see its electrical grid collapse, it would not take long for the effects to ripple across the land. The stores would be closed immediately and if the power was not restored they would not be reopened. What food they had on their shelves would go to the owners and other employees. Banks would be closed and even cash machines would not work to allow you to take out needed cash. Stores and most other businesses cannot do business transactions without power, and massive layoffs would happen in short order. America has enemies today that are working hard to create the capability to strike America with an EMP bomb, (Electrical Magnetic Pulse) this type of bomb would be nuclear in nature that would be set off high over America. It would not kill many people unless you’re flying and it hits the electronics of your airplane. This type of weapon could shut down the electrical grid to a very large region in America. The damage would not only be to the electric grid but it could fry the electronics of automobiles and any appliances and electrical equipment that runs the businesses of this country. Scientists are saying we could see the same result from a solar storm. We are currently at the peak of the 12 year cycles that could cause this type of event. In 1965 a critical electrical substation on the East Coast blew up and this one substation going down took down the electrical grid of the whole East Coast. What most people do not realize is that our whole electrical grid is made up of hundreds of substations that control the flow of electricity across our country. Each of these substations has large electrical transformers that work to distribute power. These large transformers are custom built to the specific load of that substation and the electrical companies do not have inventories to replace these transformers in the event that this was to happen. My brother in law is one of the top electrical engineers for General Electric. He works in the area of electrical power production. I asked him recently how long it would take to replace a large number of these substation transformers if this event were to happen. He admitted that they do not have replacement stock available and it could take a year or longer to rebuild these critical components. This single event would not happen slowly with a warning to get ready, it would happen without warning and we would be thrown into the dark immediately. These are just some of the options that could trigger a global economic collapse. There are other events lining up right now that could trigger this collapse in less than 30 days. Please do not label me as a fearmongerer. I believe God wants his saints to be aware of Christ’s imminent return and God has given me a trumpet to blow to wake up the church to what is soon coming. The timing of a global collapse that will propel the world into the Great Tribulation is in the timing of God and not the timing of man. Right now there are three countries with their finger on the trigger of a nuclear bomb. The leader of North Korea is crazy enough to pull this trigger; Iran is racing as fast as they can to have this ability to hit Israel with a nuclear bomb. Israel when backed up against a wall will use a nuke to show their enemies that they will protect themselves with nukes if necessary. The Bible says that Damascus will be burned by fire, never to be lived in again. Right now it is Syria that is trying to push Israel up against a wall. Imagine what will happen when any one of these three countries pulls the trigger on a nuclear bomb. Most people will fear that World War Three was about to break out. With these thoughts going through peoples minds, what will happen to food and other resources? It will be like a warning that a great snow storm is about to hit, where you see the masses buying up everything in sight to hold them over for 3 or 4 days. Imagine the masses wanting to buy enough food and resources for their families for an indefinite period of time. It will be impossible at that time to get ready for what lies ahead. I have been watching some round table talks recently with speakers covering pre-, mid- and the post-tribulation positions for the rapture. As I listen to these different speakers defending their different views, I have to admit that they all sound convincing. No matter how convincing they all are, I still know that only one view is correct. I know the timing of the rapture has no bearing on our salvation but it is important that we get it right. What I am going to explain in this section of my prophetic updates is why it will be harmful to the body of Christ for us to hold to a view on the timing of the rapture that is in error. The thrust of this update is not toward the error of the pre-Trib view, as I cover this topic in my book, “The Window of the Lord’s Return”, quite thoroughly. I will remind you that I believe the warning Paul gave in 2Thess. 2:1-3 when he warned that before the gathering unto Him, (the rapture), there would be a great falling away. I believe this falling away will happen when the global economies collapse and the rapture does not occur as those Christians who hold to a pre-Tribulation view believe. I show from Scripture in chapter 8 of my book that the antichrist cannot arrive until the 10 head one world government arrives. When this truth sinks in, you realize that the United States will go through trying times after an economic collapse (maybe 3 to 12 months) before we are willing to cancel our Constitution and join this one world government. Picture an economic collapse where our dollars lose most or all value. Imagine all credit cards being switched off like a light switch. Imagine the collapse of our food distribution system and other infrastructure. This would lead to food riots, martial law, food rationing, and famine in this country and around the world. This event has to happen before the Great Tribulation even starts. If you believe as I do that we will go through 3 ½ years once the Great Tribulation starts. Realize that once the antichrist arrives on the scene his system will force everyone to take the mark of the beast or you will not be able to buy food. Imagine 3 ½ years without being able to go to the store and buy food. The Bible says there will be great deception in the last days. Many Christians do not read their Bibles and it would be easy for many to think that God would not want their families to starve, and many will buy into the system of the antichrist. This brings me to the thrust of this paper. I want to show why the post-Trib. view or even the Last Trumpet teaching for the rapture will cause great harm to the body of Christ. If it was just a matter of letting those who want to believe that they will go through much of the wrath of God or even just half of the wrath of God during the end times, it would be fine. Those who believe this at least know they will have a rough road ahead. It is not this simple though. Realize 80% or more of Christians in America believe the rapture is a pre-Tribulation event. As a teacher of a mid-Tribulation rapture it is my goal and my burden to warn this high number of believers that they will not be prepared to go through what lies ahead. In my teachings I show that even though we will go through 3.5 years of the Great Tribulation, we will not go through any of the wrath of God. I show why the seals are not the wrath of God and we are raptured at the end of the sixth seal. I show that God has a purpose for our being on earth during this time: so we can be used to win the lost and stop our friends, family and neighbors from taking the mark of the beast. I believe that once people have made their choice to either serve God or the antichrist, our job is done and we have no reason to stay on this earth any longer. Here is where the danger lies in promoting either the post-Trib position or the last trumpet position. These two positions are one and the same for many. As I have heard admitted post-Tribulation teachers say that the rapture would happen at the last trumpet of Revelation. This would mean that the body of Christ would be going through six trumpets of God’s wrath. Even those who say we will be on the earth until the last trumpet are not thinking this through. The first trumpet of God’s wrath says 1/3 of the earth is burned up. The earth is 2/3 water and water does not burn. How can you imagine that the saints could escape this if we were still on the earth? The 5th trumpet has scorpion creatures stinging all except for the 144,000 specially marked Jews. Notice there is no provision for the saints because they are already at the throne of God. Here is where I see the real danger in the post-Trib and last trumpet teachings. The pre-Tribulation believers understand strongly from their study that the saints are not accounted to wrath or the wrath to come. This is the stand that they will take when presented with any view that shows them going through the wrath of God. They will not accept this teaching and will therefore just stay right where they are and remain unprepared. The post-Trib, position does not give them anywhere to go. As a result, this 80% or more of all Christians are heading for great danger and a great falling away. In closing, I am going to share a few new insights that show why the last trumpet teaching is flawed. Please realize this is not a personal attack on any one individual who may take this position. I have a friend in the faith, a great teacher who I love and respect, who holds this position yet we have to agree to disagree. I cannot change someone’s views; it takes the Holy Spirit to do that. The last trumpet teaching comes from 1Corinthians 15:52: “In a flash, in the twinkling of an eye, at the last trumpet, for the trumpet will sound and the dead will be raised imperishable and we will be changed.” This teaching takes the position that there is only one last trumpet in the Bible and that is the 7th trumpet of God’s wrath found in the book of Revelation. Without going into great detail, I share in my book that the book of Corinthians was written to be understood at the time it was written. The book of Revelation would not be written for almost another 40 years. What would have gone through the minds of the Corinthian church when Paul sent them this letter? I believe they would have thought of the annual feast of trumpets that they celebrated every year and in my book I show this feast illustrates an Old Testament type of the future rapture of the church. When you read chapter 11 of my book you will get the full details of this study. Another point, similar to the one above, is when the different books and letters that make up our Bible were written, these different writings that would one day make up the Bible we have today were scattered throughout the church. It wasn’t until three hundred years after all the books of the Bible were written that they were assembled and arranged into the order we have today. This would mean that the interpretation from the verse in Corinthians 15:52 could not have been made for 300 years. Do you really think that when Paul wrote the letter to the Corinthian church that they were not to understand this verse for 300 years of church history? In doing further study, what I have uncovered is quite interesting and backs up my position that we are not to go through any of the wrath of God. The seven trumpets are given to seven angels who stand at the throne of God in Revelation 8:2. It is shown throughout the Bible that whenever judgment is being delivered that judgment is delivered by angels. I show that in the seven seals there are no angels involved because this is not the wrath or judgment of God. There is only one reference in the Bible that refers to the rapture happening at the last trumpet. It was at the final trumpet of the Feast of Trumpets, when the high priest would blow this trumpet. Moses led the people at that time to the mountain to meet with God. Notice that the top of the mountain was covered with clouds. It makes so much since this last trumpet is referring to the final trumpet in the celebration of the Feast of Trumpets. When I examined other New Testament verses that speak about the trumpet that will signal the rapture I found two examples that paint an interesting picture. One verse says “the trumpet call of God would sound”, not the trumpet blast of an angel and the second verse shows that the angels were waiting to hear the trumpet that Christ would sound that would send them off to gather the elect in the rapture. Matthew 24:30, 31: “They will see the Son of Man coming on the clouds of the sky, with power and great glory. And he will send the angels with a loud trumpet call and they will gather his elect from the four winds,” This is just as it was in the Old Testament Feast of Trumpets where the high priest would blow the final trumpet. When the rapture is to occur our high priest Jesus will blow the trumpet that will send the angels out to gather His elect. In closing, I have a major point I need to make as it applies to the last trumpet teaching. This will require you to look closely at what I will share with you. This is a very important teaching and takes several paragraphs to lay out. Once the wrath of God starts with the seven trumpets of God’s wrath, there will be no recess or break from God’s wrath. John, who is relating what he sees in the scroll as he is writing the book of Revelation, is interrupted. If you read Revelation chapters eight through ten you will see that John is giving us a blow by blow of what is happening as angels are delivering the seven trumpets of God’s wrath. Then John is told to stop writing about the wrath of God. John is told to stop writing about the wrath that is unfolding and go back and write about those who were being discussed leading up to the rapture in Rev 7:9. As the angel instructs John to read a second scroll, this is a different scroll from the one he had been reading previously. This scroll is called a little scroll. I will write out part of Rev.8-11, however, I encourage you to read this chapter and section to see that I am keeping things in context. Rev.10:8.-10: “Then the voice I heard from heaven spoke to me once more: “Go, take the scroll that lies open in the hand of the angel who is standing on the sea and on the land.” “So I went to the angel and asked him to give me the little scroll. He said to me, Take it and eat it.” …I took the little scroll from the angel’s hand and ate it. It tasted as sweet as honey in my mouth, but when I had eaten it, my stomach turned sour. Then I was told: you must prophesy again about many peoples, nations, languages and kings.” John had been giving a blow by blow account of the wrath of God, when all of a sudden he is interrupted and told to take a break from the wrath of God and go back and prophesy again about the same ones that were discussed before the rapture. If you will study all that is written in this parenthetical section that goes from the seventh trumpet until the seven bowls of God wrath starts up, you will discover this section is not in chronological order. A good example of this is Rev. 14:1: “Then I looked, and there before me was the Lamb, standing on Mount Zion, and with him 144,000 who had his name and his Father’s name written on their foreheads.” This was really confusing to me before the Lord showed me what was happening with this section. You see Jesus is on Mount Zion with the 144,000. This can not happen until after the battle of Armageddon, when Jesus returns and steps on the Mount of Olives. This is out of chronological order. When you read in Rev. 14 about the angels preaching and warning people not to take the mark of the beast, this has already happened before the rapture that happens in Rev.7:9. Rev.13:1 describes the beast coming out of the sea. This is the forming of the one world government. This also has already happened before the antichrist arrives. Because teachers have taken these chapters to be in chronological order, it has led to many misinterpretations of the word of God. Another example of confusion coming from this is Rev.13:5 where it says that the antichrist will exercise his authority for forty-two months. This has led teachers to say that the antichrist will only rule for 3.5 years. This is not the case. The antichrist brokers a seven year peace with Israel and breaks it in the middle. What this verse is referring to is the war on the saints that will give the antichrist authority and power over the saints for forty-two months. Rev. 13:7: “He was given Power (this is authority) to make war against the saints and to conquer them.” Read Daniel 7:25: “The saints will be handed over to him for a time, times, and half a time.” This is 42 months. If you will read further in Rev. 11, you will see the account of the two witnesses and it shows them dying and lying in the streets which does not happen until they have been on the earth for 3.5 years, another example of this parenthetical section of Revelation. I believe those who think the rapture is at the last trumpet see this event as the rapture. It makes more sense that while the wrath of God is being poured out on the earth, the dead in Christ will be having what is called the judgment of the believers and then we will receive our rewards. I believe after this awards ceremony we will move on to the marriage supper of the lamb; maybe after the marriage supper of the lamb we will have a honeymoon period in our new home before returning with Christ for the battle of Armageddon.